I have a love-hate thing with potatoes. I generally like them mixed in with other veggies, but am a lot more selective about eating them when they are the main veggie. Although they take a long time to cook, scalloped potatoes are great because the potatoes don’t get mushy. When you make them, the quantity looks like it belongs in a smaller pan- I started out using an 8×8 pan but realized that the 9×13 would taste better because it would be a thin layer (and have more area on top that gets crusty). 1. Prepare white sauce: Saute the onions and garlic in butter on med-high heat for ~3 mins. Add the flour and mix well for 2 mins. Add the milk slowly, mixing constantly so lumps don’t form. Add the salt and pepper. Bring to a boil and cook, stirring constantly for about 5 mins. Layer 1- In a 9×13 baking dish, arrange the potato slices in a layer (it’s okay if they overlap). Layer 2-Spread all the peppers on top. Layer 3- Spoon half of the white sauce on top. Layer 4- Sprinkle the Parmesan cheese and ~1/4 cup of the Cheddar cheese on top. Layer 5- Arrange the remaining potatoes in a layer on top. Layer 6- Spoon the remaining white sauce on top. 3. Cover with foil and bake at 350 F for 40 min. 4. Remove foil and sprinkle bread crumbs on top. Bake for another 10 mins. 5. 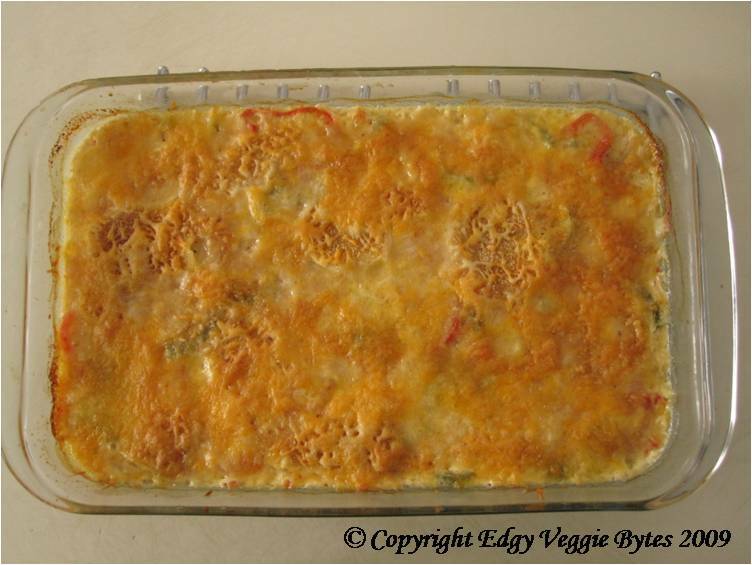 Sprinkle remaining Cheddar cheese on top and bake for an additional 15 min, or until the cheese browns. Serve hot!